I temper my expectations for a Neil Gaiman novel: I view him as being a style-over-substance writer, whose emphasis is on crafting a setting and evoking a mood – usually with a heavy overlay of clever and witty use of language – rather than being strong in plotting, characterization, or giving his stories meaning. Indeed, Gaiman is someone to avoid if you mainly want character development, as his main characters tend to be either everyman sorts (Neverwhere, Stardust, Anansi Boys) or empty shells (American Gods, and the hero in this book). I actually do enjoy most of his books, because of his strengths, but because I tend to prefer books which are based around his weaknesses, I never expect or hope that one of his books will become a favorite. So it was with The Graveyard Book, an homage to Rudyard Kipling’s The Jungle Book. I’ve never read The Jungle Book (shock, horror from the audience), nor even seen the Disney film (even more shock and horror), but a friend of mine summed up both books like so: “In The Jungle Book, a boy is adopted by animals and learns the things that animals know. In The Graveyard Book, a boy is adopted by dead people and learns the things that dead people know.” A fine summary, as the book opens with man with a knife named Jack kills a family in a nameless town in England, save for the youngest child, a toddler who happens to toddle away to a graveyard during the massacre, where he’s saved by the spirits in the graveyard, adopted by a couple there, and given the name Nobody Owens. “Bod” grows up in the graveyard, rarely leaving it because his guardian, Silas (who is hinted as being a vampire), says that Jack and the cabal behind him are still looking for Bod, and only in the graveyard is he safe. So his parents and friends in the graveyard teach him the knowledge and skills of dead people, even though he’s still alive. But they also prepare him for his eventual rejoining of the living world. The book is told in episodic form, as Bod learns about the skills that dead people have (fading from view, walking in dreams, instilling fear), and also learning about some of the less-visited nooks and crannies of the graveyard. He does, of course, venture out of his home, which eventually leads to a showdown between Bod and the cabal. But for the most part you’ll either accept the premise and enjoy the individual stories – which are only loosely linked, although several points are recapitulated in the climax – or not. For myself, I did enjoy the stories Bod follows a fairly traditional “hero’s-coming-of-age” journey, questioning his elders and the rules he lives by, then coming to learn when he should follow them and when he should break them. I particularly like “Nobody Owens’ School Days”, when he ventures out to attend a regular school and has a variety of adventures, partly because his motivation to do the right thing by other kids gets him in trouble with the bullies, and events spiral out of control from there. His confrontation with the cabal signals the coming of his adulthood, leading to a bittersweet ending, but I was disappointing in the climax since we never really learn why the cabal are so set on killing Bod – the reasons are hinted at, but so vaguely that they’re hardly sufficient to explain the events which set the story in motion. Gaiman sometimes gets too caught up in being mysterious and leaving holes for the reader to fill in, and that’s the problem here, as more specificity was sorely needed. 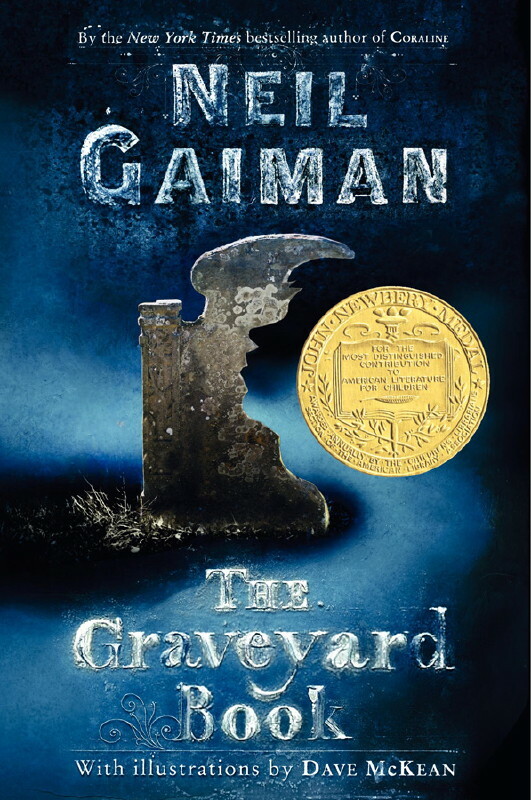 As a book aimed at the “young adult” market (which I always instinctively think means 18-22 year olds, but which really means 10-14 year olds, I think), for an older audience The Graveyard Book is an easy read and could be summed up as “enjoyable but light”, sliding in as better than Stardust and about on par with Coraline. (This is a good point – as he illustrated both books – to make my obligatory statement that I cannot stand Dave McKean’s artwork. His work is better here than in Coraline, but it still fails to be either illustrative and evocative, and frankly I just find it ugly. Your mileage may vary.) As someone once said, if you like this sort of thing, then this is the sort of thing you’ll like. While it’s full of wonderful imagery, I don’t think it’s a story that will stay with me for very long.